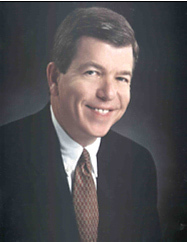 College administrator and Missouri Secretary of State elected to US Congress for seven terms beginning in 1997, succeeding Mel Hancock. Served as House Majority Leader after Tom DeLay's 2005 indictment. Elected to US Senate in 2010, succeeding retired Senator Kit Bond and succeeded in Congress by Billy Long. Conservative Republican; generally anti-abortion rights, anti-gay rights, pro-gun rights, anti-net neutrality. Supported 1998-99 Clinton impeachment, 2001 USA PATRIOT Act, 2002 Iraq War resolution, 2004 restriction to bankruptcy rules, 2008 Wall Street bailout; opposed 2008 GM/Chrysler bailout, 2009 economic stimulus, 2010 health care reform. In 2013, inserted the "Monsanto Protection Act" rider into an emergency budget bill, exempting Monsanto's genetically modified organisms (GMOs) from judicial and regulatory scrutiny.